Joseph was sold by his brothers to Ishmaelite traders and he was taken by them to Egypt. In Egypt, he was sold again and was bought by Potiphar, an official of Pharaoh and the Captain of the Guards, to become his slave. Remember he is in a new environment with different language, culture and beliefs. Consider that Joseph was taught by his father that there is only one God but in Egypt there are many gods. So, I guess, it's a big and scary adjustment for Joseph. But do you know who was with Joseph? (God) Yes! God was with Joseph and gave him success in everything he did. Potiphar saw that it was good to make Joseph care for everything he owned and so he was put in charge of his household. Looks like things are doing great for Joseph. He prospered because he continued to trust God. But here comes the problem - Potiphar's wife. She likes Joseph and wants to sleep with him. This is something that only husbands and wives can do. Joseph knew that this was wrong and a sin against God. And so, though Potiphar's wife kept telling him, he refused to be with her. But one day, Joseph was left alone in the house to do his duties. Potiphar's wife took advantage of the situation; grabbed Joseph's cloak and said to him "Go to sleep with me." Joseph ran away and left his cloak because he did not want to do what is wrong. Potiphar's wife, however, told a different story. He showed the household servants as well as his husband Potiphar the cloak and told them that Joseph came to make sport of them. Potiphar's wife accuses Joseph. Image from Wikimedia. That is a complete lie, of course! But Potiphar believed his wife and threw Joseph into prison. Oh no, in jail, back to squaare one again. This is not a very pleasant situation for Joseph, but he continued to trust God. Now, even in prison, the Lord was with Joseph. Soon, he was put in charge over those in prison by the warden. The story of Joseph is becoming more interesting, but we'll continue the lesson next week. Now let us discuss what we learned from the story. 1. What happened to Joseph in Egypt? 2. How do you feel when you got lost and become alone in a place you don't know? What should you do? 3. Who helped Joseph succeed in everything he did? What did Potiphar do to Joseph? So what should we do if we are in a similar situation as Joseph? 4. What wrong did Potiphar's wife do? What did Joseph do right? 5. If you're in a situation where you are being tempted, what would you do? 6. Give examples of situations wherein you are tempted. Tempted means being encouraged to do something wrong. 7. Because Joseph did what is right, what happened to him? 8. Do you think life is unfair to Joseph? How about you, do you think life is unfair to you? 10.What did you learn from this story? The Lord was with Joseph and gave Him success in whatever he did. 1. Role playing: Group the children into 2 or more. Ask the children to think of situations wherein they are tempted to do wrong. Let each group act a situation and show the right thing to do in that situation. Alternatively, you can prepare ahead different situations which you will ask the pupils to act out. 2. Play Potiphar says. This is just simliar to Simon Says. 3. Some activity ideas from Pinterest. 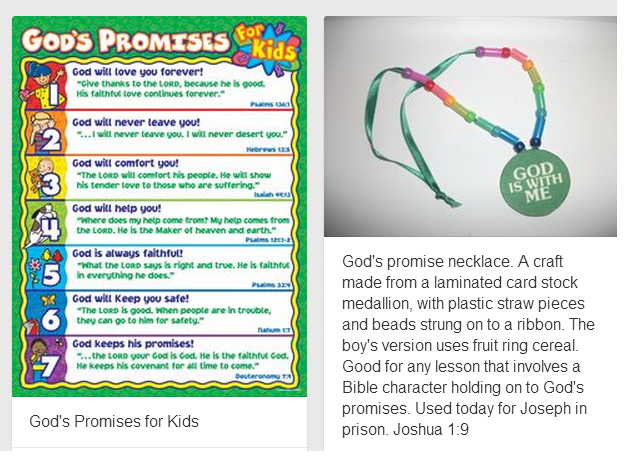 Teach the kids the 7 God's Promises for Kids or make necklace with a pendant which says "God is With Me."